Since the past November 7th 2003 United Nation Educational, Scientific and Cultural Organization (UNESCO) has admitted that Indonesian leather puppet as the World Master Piece of Oral and Intangible Heritage of Humanity. International world has confessed the existence of “Keris” Indonesia, all at one it got a world award since November 25th 2005. 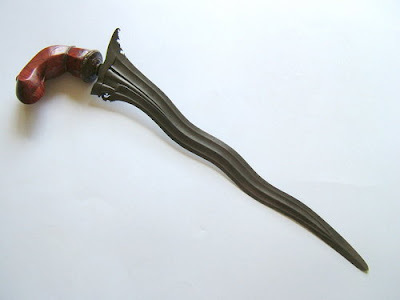 “Keris” Indonesia has also admitted by UNESCO. United Nation Educational, Scientific and Cultural Organization (UNESCO) has affirmed tradition of Batik as one of the world cultural heritage which is original from Indonesia since October 2009 ago in French. Indonesia needed three years for the proposal. This song was ever being snatched by two countries that are Indonesia and Malaysia. After a long debate, the issue of the song Rasa Sayange was finally completed on 12 November 2007. In terms of de facto, the song was finally recognized belongs to Indonesia. This song is quite popular and has been distributed in Johor and Selangor by Ponorogo community who lived in Malaysia since many years ago. Reog Ponorogo traditional dance has been admitted by UNESCO as a partof the original culture of Indonesia. Eventhough the Ponorogo society who have ever lived in Johor and Selangor developed the culture of Reog Ponorogo that they take from Ponorogo, East Java, Indonesia, the origin of this culture remains ultimately belongs to Indonesia, which is now recognized internationally. Pendet dance which appears in a promotion film Enigmatic Malaysia is an original culture of Indonesia. Eventhough it has ever been claimed by Malaysia, Balinese Pendet dance actually belongs to Indonesia which comes from Bali Island. Nowadays, Pendet dance has been admitted internationally through UNESCO as a part of Indonesian original dances.